July 9-10 in Rossland – Sold Out! 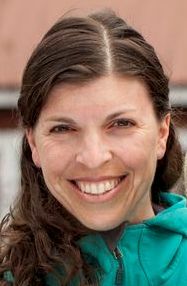 Aug 15-16 in Prince George – Registration open, limited spaces! 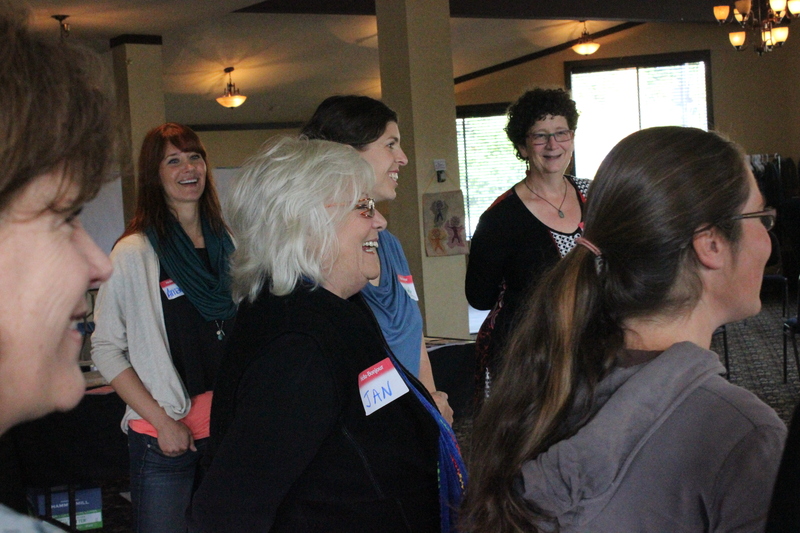 engage participants in creative conversation? add innovative and participatory techniques to your meetings and work? help groups explore and discuss complex topics? Visuals spark the imagination, help communities plan their futures and help groups track progress. Putting words on a page assumes people will understand them exactly. Adding visuals invites conversation, discussion and exploration. This two-day experiential workshop provides the skills and confidence needed to use a range of visuals in your work and engage beyond words. 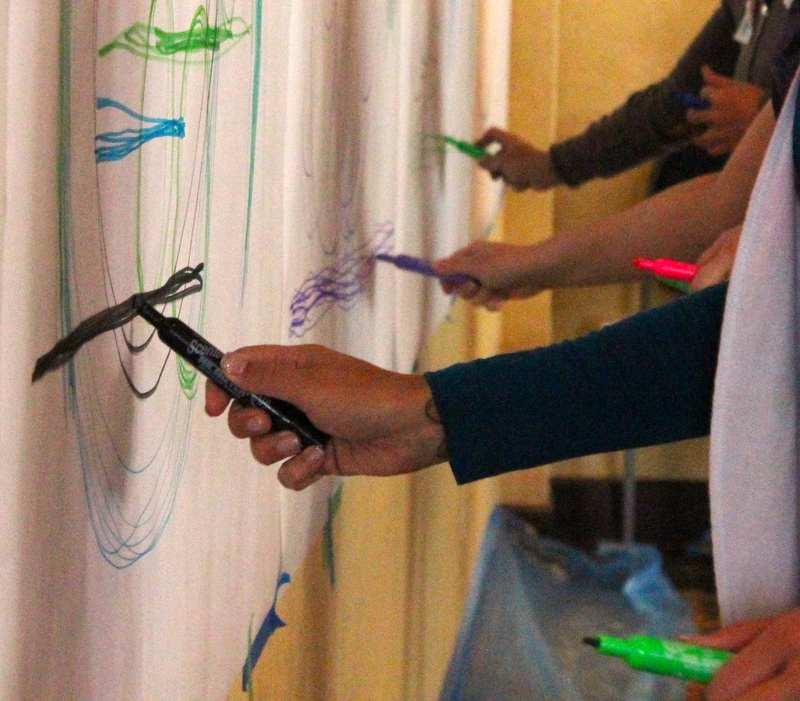 The first day, we will start out by touching the paper, playing with the pens and loosening up our drawing muscles. We’ll silence those pesky inner censors and address the basics of “drawing on walls” including basic shapes, lettering and some initial iconography. You will learn a variety of ways to draw faces and people, an often intimidating but key element for visual engagement. We’ll cover basic techniques and tricks that enable any of us to draw as a way of capturing and communicating ideas with each other. At the end of the day, you will apply your skills by visually planning a real project or meeting you have. Facilitation techniques including icebreakers, giving and receiving feedback and flip chart enhancements will be interspersed throughout the day. The second day we will apply our graphic skills in practice. We will explore how visuals can enhance group processes such as planning, meetings and evaluation. We will create mind maps, mandalas and a range of practical templates. 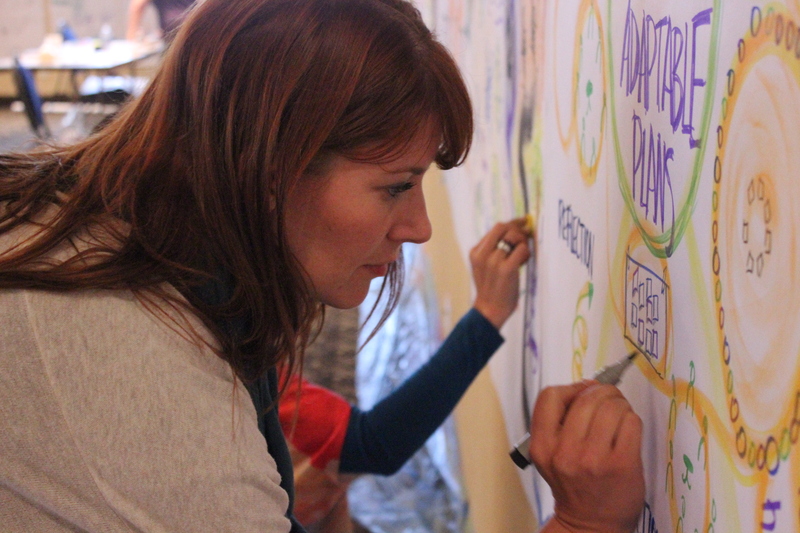 We’ll look at the use of visuals and participatory graphics (where the pen goes into everyone’s hands) with group facilitation methods such as World Cafe, Open Space, and others. We will pay attention to preparation, the actual visual work, and follow up including digital capture of paper-based images. There will be time for lots of practice, feedback and facilitation support. Throughout the two days you will have a safe, supportive (and fun!) space to practice and build confidence for real work settings. We also host a community of practitioners online who give constructive feedback and support long after the workshop is over. – You are looking for a giant boost of inspiration, creativity and fresh ideas! You might be a facilitator, community planner, team leader, trainer, teacher, project manager, marketing guru, organizational development consultant…everyone is welcome. You do NOT need previous experience or have to consider yourself an artist. 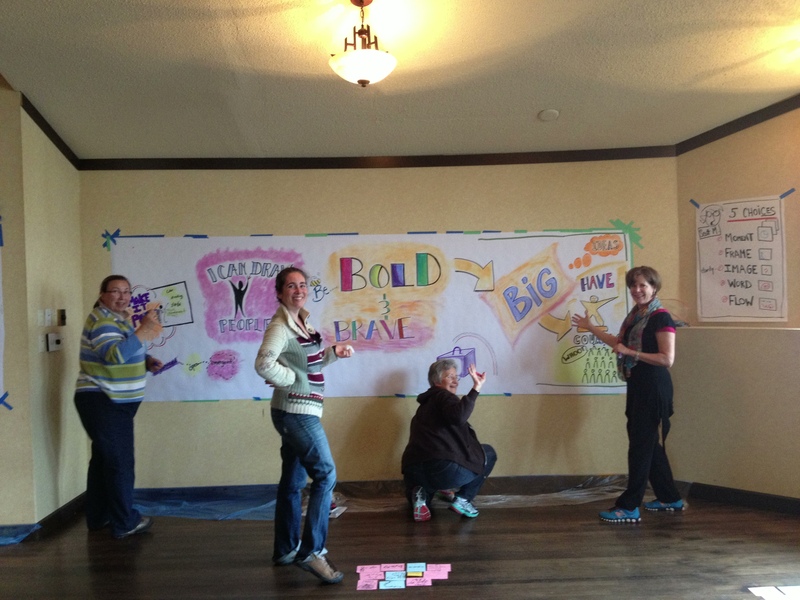 At some level, we can all draw and use simple visuals to enhance our communications and engage diverse audiences. 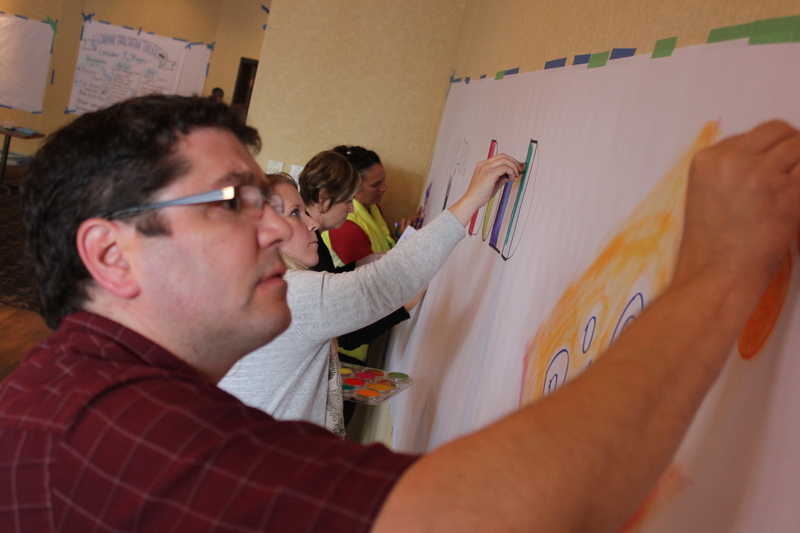 Check out our reflections and photos from 2015 here, reflections and photos from 2013 workshops here and here, and the Harvest from the 2012 workshop here and one participant’s Prezi showing the rosviz12 Harvest Journal! “I really thought the workshops was useful for me, and I’m not an artist. In a short period of time (2 days) I was able to learn simple and effective techniques to communicate basic ideas using symbols, easy figures, and colour. What I really liked about the workshops was that it was BIG. Big paper, whole body movements, large images. I’ve always drawn on small pieces of paper and this was a whole body experience! We also did some great listening exercises where in a short period of time, we had to illustrate big ideas (that were on an audio recording). It was a lot of fun and a new challenge. We will supply the basic materials for the 2 days (and you get a starter kit to take home). Feel free to bring your own set of materials to play with as well. COSTS: $875 CAD + GST (5%); Prince George workshop has sponsorship so fee is $500 CAD + GST (5%) . Costs include two days of training with trainer, social reporter/graphic facilitator, personal starter kit, plenty of healthy drinks and snacks (Rossland), lunch provided (Prince George only thanks to sponsorship), post-workshop online community and support network as well as a 1:1 coaching session for each participant. Please note meals, lodging and transportation are not included. Accommodation information available upon request. Dates: July 9-10, 2018 – SOLD OUT! August 15-16, 2018 – will run with 10 participants. Locations: Prestige Mountain Resort, Rossland, British Columbia (closest airports Trail, BC; Castlegar, BC; Spokane, Washington in the USA) AND Prince George, BC location to be confirmed. 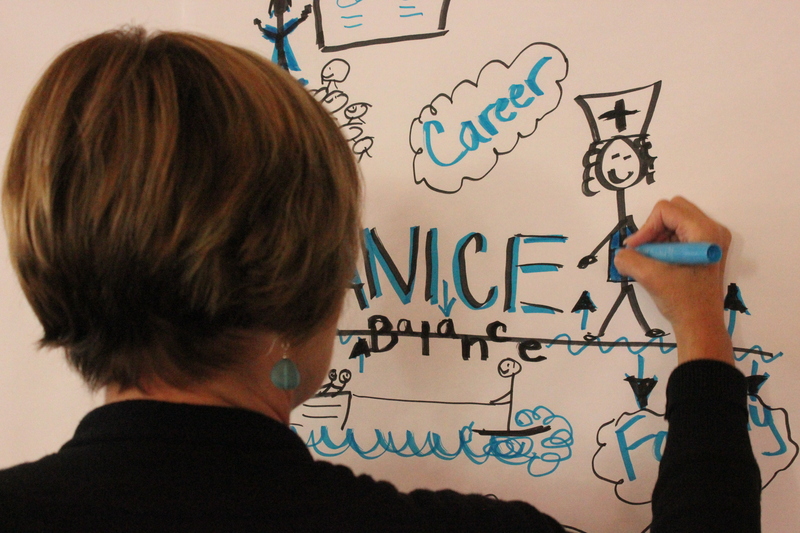 Michelle Laurie has hosted and led over a dozen graphic facilitation workshops since 2010. 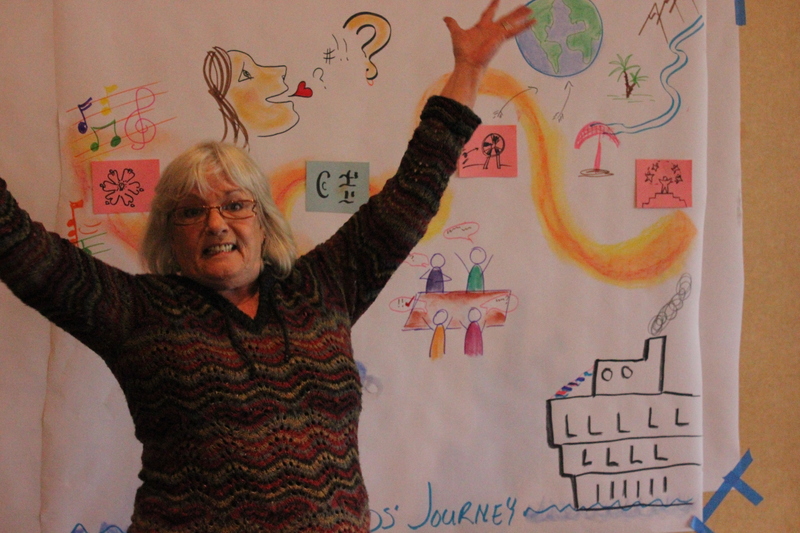 It has been an absolute pleasure to share the skills and fun of graphic facilitation with people working in health, the environment, community development, planning, education, marketing, agriculture and technology. On a personal level, despite being an analytical person, visuals have brought new and meaningful ways to engage others in meetings I design and facilitate for a wide range of organizations. It’s truly energizing! My work is at the interface of environment and development and includes strategic planning, assessments, facilitation and engagement. I help organizations, researchers and communities transform their ideas for positive change into realities on the ground. I incorporate visuals wherever I can particularly with the use of participatory graphics, templates, animation and reporting. Lisa Thiessen demonstrates tape tricks!